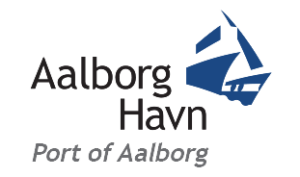 The Port of Aalborg is an active and rational part of our port client’s supply chain; a hub for all types of freight and all kinds for transport by ship, truck and rail – with Nordic Transport Centre, integrated into the overall service, which also includes including Danish Carriers terminal and warehouse. Together with Aalborg Portland A/S, the Port of Aalborg is the fifth largest port system in terms of total cargo volume in Denmark. Port of Aalborg is also Europe’s only base-port for Greenland – with a weekly connection to Greenland, and a direct extension of the global container network through feeder route Rotterdam – Aalborg – Gothenburg. The container terminal at the Port of Aalborg has a capacity to handle 100,000 containers annually. From the special project berth shipped ongoing offshore installations and wind turbines, handled all kinds of material.